Interception is one of the most astounding tactical procedures. It involves the blocking of a direction (rank, file or diagonal) in the idea of reducing the range of action of an enemy piece. It is often done with a piece sacrifice. 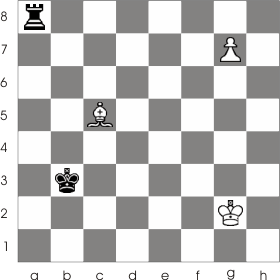 In the next example the black king has a very bad position. The fastest way he can be checkmated is 1. Bg3-d6!. With this move White blocked the black queen (the a3-f8 diagonal); 1... c7:d6 2. Qh4-h8+Now the Black queen isn't able to move to f8; 2...Ke8-f7 3. Qh8:g7+ Kf7-e6 4. Qg7-e7 Checkmate! The game below was played in 1924 between Reti and Bogolliubov at New York. White played Rf1. With this move he threatens checkmate at f8. The black bishop can't be moved (if 1...Be7 then 2. Qf7+ Kh8 3. Qe8 ). The only thing left to do is to protect the f7 square. Black chose to move 1...Rd8; with 2. Bf7 the Black king is forced to the h8 square and with 3. Be8 White performs the interception. With this final move White manages to isolate the bishop's defense. 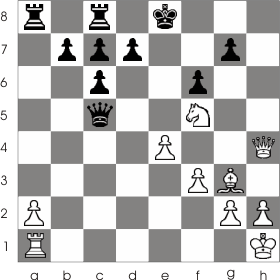 Even if the black queen comes to protect her bishop is too late: 3...Qe7 4. Q:f8 Q:f8 R:f8, checkmate! 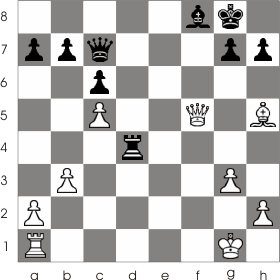 (The same thing happens if Black chose to capture the white bishop from e8.) Had Black chosen to protect the bishop using the queen 1...Qe7 then Bf7+ Kh8, and this time Bd5 would interrupt the black rook which could come to protect the bishop. The next position is interesting. 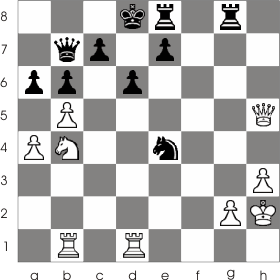 Black moved his knight to e4 in the idea of threatening the double attack on c3 over both white rooks. But White has a surprise! The only thing protecting the knight is the queen. With 1. Nb4-c6+ White has intercepted the direction over which the black knight was protected and checked the opponent, so that he is forced to move the king: 1... Kd8-d7. Now White performs a double attack over the king and knight 2. Qh5-f5+ e7-e6 3. Qf5:e4 and White wins a knight.